Ready to upgrade? Let us help you determine the best model for your application. 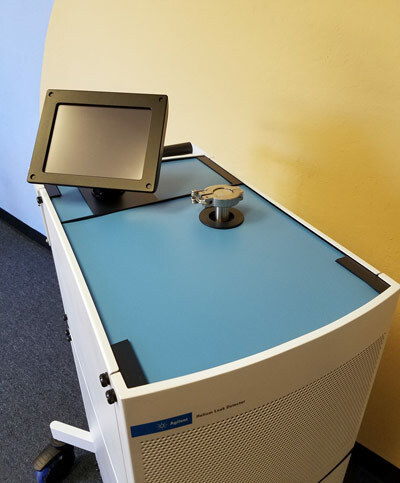 The Agilent HLD Series are the same dependable VS Helium Leak Detectors in a new cart, with enhanced menu navigation on an 8” LCD screen with new setup wizards, and a small work surface. Also available in Bench Mount configurations. See more info. These nicely reconfigured leak detectors are compatible with the highly efficient Kashiyama roots-rotary pumps. NeoDry30E pumps have fast cleanup and low lifetime ownership costs. Check out the spec here. Call or email to get a quote for your new leak detector today! Each unit comes with our 6-month warranty. 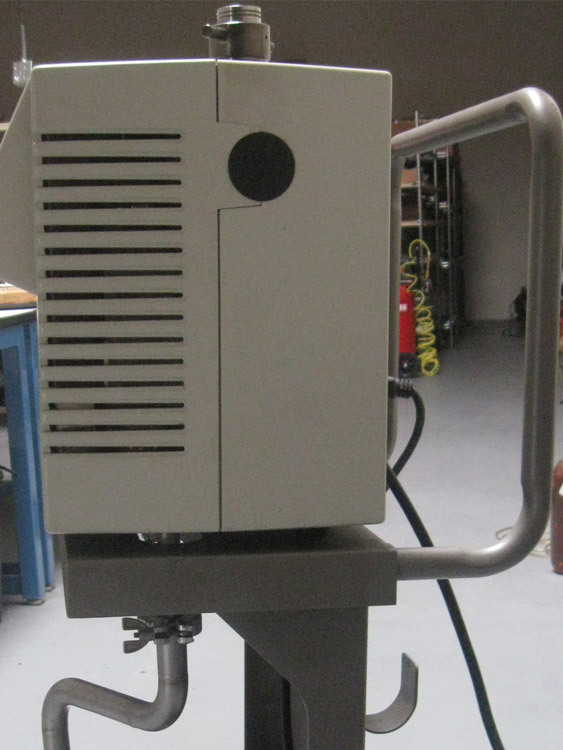 This Agilent VS MD-30 Leak Detector is a wide-range Helium Mass Spectrometer Leak Detector. Utilizing a turbo molecular high vacuum pump and external TS620 dry scroll pump, this efficient leak detector is mounted on a convenient 4 wheeled cart for easy mobility. The simplified operator interface is adaptable to many applications with ease. For specs on this leak detector please refer to the Agildent brochure (pdf). This MD-30 is configured in 115 VAC mode. Transportation and setup not included. Please call for a complete quote. 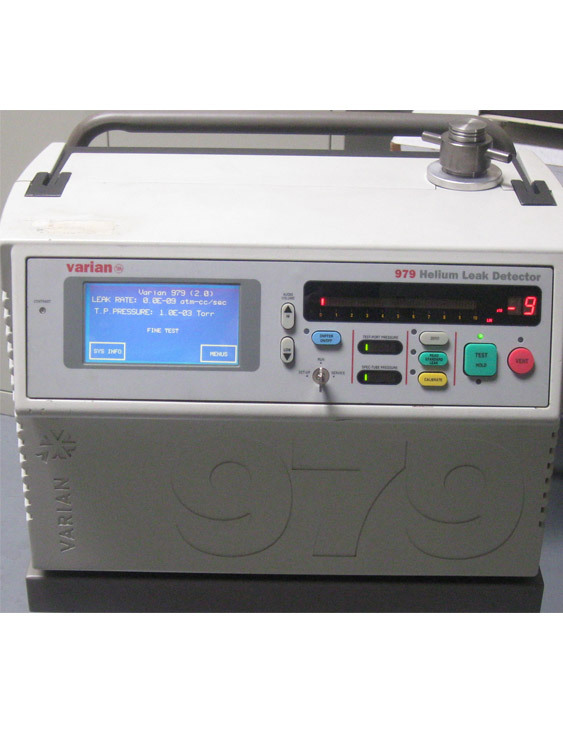 The dependable, no frills Varian leak detector has a V-70 turbo for 9-scale sensitivity and a TS320 Dry Scroll Pump on a 4-wheel cart. 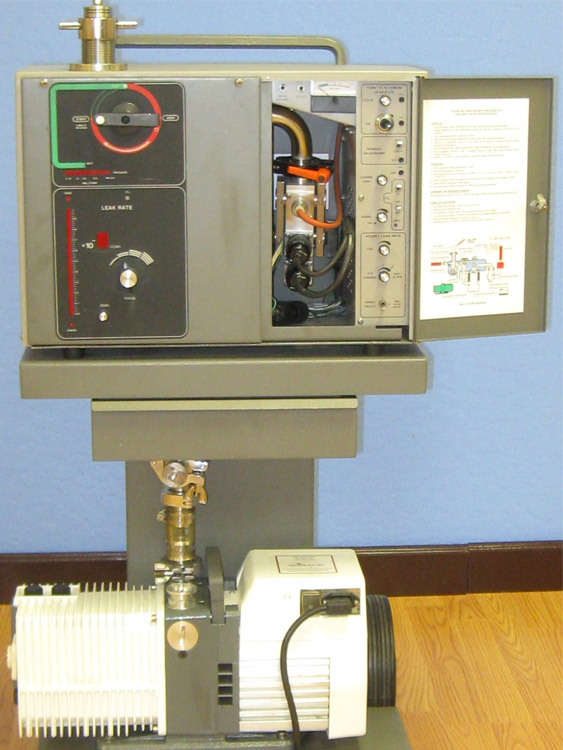 A NIST Certified external leak is provided with this unit. It is configured in 110VAC mode. For specs on this leak detector. See 959 brochure (pdf). Peel and protect your touch screen from sharp objects and excessive wear. Easy installation, robust protection from tools and accidents. Flips up for access touch screen during test process. Use your helium sparingly with this handy Spray Probe. The small (0.0625") ID on a flexible copper pipe allows you to spray where you need it. Supplied with a long 1/4ID Tygon hose to attach to the regulator of your Helium Bottle to minimize bottle movement and maximize ease of access to your parts. Regulator not included. This custom nut will secure your test port against the leak detector cover for greater stability during testing. These compact oil mist eliminators attach to the outlet flange on your rotary vane vacuum pump, supplied with filter element, a KF25 centering ring and clamp. Durable nylon housing. Intended for pumps working at pressures exceeding 10 mbar where the discharge of fine oil mist into the surrounding environment is undesirable. For pumps and leak detectors, quiets and filters, protecting your equipment. 1/2 NPT used in many older Varian model LD, Alcatel pumps, etc. M5 used in Agilent VS series Leak Detectors. Protect the work surface of your new HLD Series Leak Detector with this Mat Set. All 3 compartments of the work surface are covered. Expertly fabricated by our partner lab. See the info sheet (.doc). The Mass 4 Service Basic Operator Training Workshop is an intensive, one day workshop that provides practical, hands-on knowledge along with basic vacuum fundamentals. A solid understanding of basic vacuum system function, along with customized knowledge pertaining to your in-house leak detector(s) and processes to encourage each operator to become more proficient at leak check processes. Recommended for Leak Detector Operators, Production Leads, Quality Personnel and Lab Technicians who use the leak detection equipment, or supervise leak detection processes. Please call or email for current pricing and to set up your workshop. See the workshop syllabus (pdf). We accept major credit cards. Terms available for well qualified businesses.